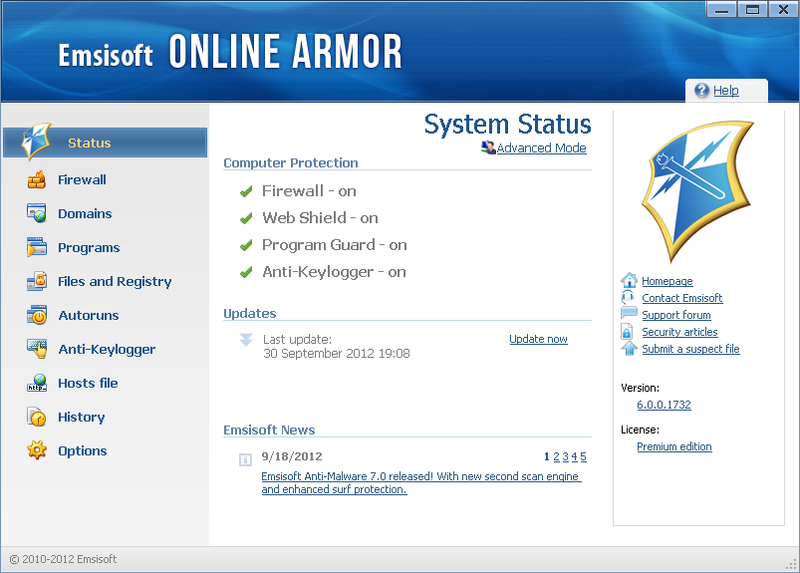 Online Armor provides a blend of usability and hard-wired PC security to ensure a good user experience. This award-winning program is easy to use and provides 100% leak protection out of the box. The powerful HIPS functions, which is designed to stop all unrecognized programs from running on your computer, makes it possible to protect yourself against new threats and attacks. No free version. period. Even if you try do download "Free Version", it is still a 30 day trial. Piece of crap. free firewall_hips i have tried them all............. Online Armor is the best, It installs like a breeze ........ very easy to configure,it can even restrict anybody from messing with the control panel and many more ...... so far with Online Armor Free, Ninja Pendisk, Trust no Exe ..... yes!!! no Antivirus in my pc, ( Intel Celeron, 2.26 Ghz., 64 mb built - in video, 512 RAM ). Using v. 5.0.0.1097 and pleased thus far. Used the advanced install, which was straightforward. The interface is clean enough, though better integration with the Windows 7 api would be nice. Having said that, the free edition provides plenty of useful information quickly, and has not hassled me with popups or pleas to purchase upgrades... yet. Uses approx. 15 GB RAM at system idle on my machine. you do need a fast computer for this program! Not perfect, but ... and another "brainless comment" of CyberDoc999 !!! *It is not overly talkative - Default settings produce very minimal pop-ups. Higher settings will [of course] create more messages. One of the very best...and it's free!! - Autorun Protection Limited ! why? I have been using this firewall for about the past 4 versions. I dumped Comodo because it was WAY too bloated. I personally CANNOT see why all thses people are complaining about this program "slowing their computer and internet down". I have an OLD machine (AMD K6(2)-450MHz with 384MB RAM, an old 16MB video card, and Windows XP with SP2 (cannot use SP3 it caused issues)). So if this program would slow down a computer I would DEFINITELY notice it, AND IT DOES NOT SLOW IT DOWN AT ALL. PERIOD. Personally I think it is their LACK of config'ing it right or some other software that does not play nice with it. This program works like a CHAMP on my system. Made my system slow and unstable. Like the filter-by-country feature. I'm not seeing all the high CPU utilization mentioned here. I removed CIS because of the bloat/impact of late and moved over to OA because of the high ratings. I DID take the time up front to configure it correctly. The initial learning phase for things like unregistered "portable" apps on the system is minimal if you answer the questions correctly. Even Windows UAC is less annoying.